Hello, blog readers! My name is Jennifer, and I am a Creative Director that sometimes help Stephanie with her Steadfast Social Media. I love posting to Stephanie’s Instagram, designing images for her blogs, and keeping you all up to date with her newsletters. I hope you all have been enjoying the content! I am also a wedding planner / designer and operate Oh Hello Events in Tampa, Florida. 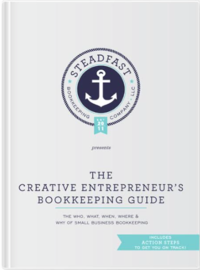 As a creative small business owner, I relate to Stephanie’s bookkeeping tips and small business advice. I’ve learned SO MUCH reading about how to balance your books, what counts as a business expense, and many other topics. There are some lessons you learn best by experience though and one of those big ones for me happens to be pricing. A good friend told me the other day “You’re supposed to be fast, you’re the professional. You need to charge based on the value they will receive not the amount of time it takes you.” She was responding to a pricing issue I was facing in which a client’s budget didn’t suit what I typically charge. I was immediately trying to justify that I could accommodate them this time, because it was a task I could probably complete quickly. But, when you devalue your work, it becomes easy for that to become a habit and be detrimental to your business. Charge by the hour. The typical equation for this is: (Amount you want to earn annually) / 50 weeks / 5 days per week X 2.5 (factoring in expenses) = per diem / 8 hours = your hourly rate. Charge a flat rate based on the project. This is the most common way wedding industry professionals charge. But, how do they determine this fee? Often based on local industry standards, estimating how much time a project will take and then calculating a price based on your hourly rate, or developing package prices based on how many projects / weddings / clients you take on annually that will help you sustain and grow your business. Some creative small business owners work on commission, or based on a percentage of a client’s budget. Given the methods of determining pricing, how can you increase the value of your work to help increase your prices? Evaluate your client experience. Luxury pricing should be accompanied by a luxury experience. This doesn’t necessarily mean expensive client gifts, but refers more to curating positive ways of communicating, anticipating client needs, being responsive, and expressing your brand thoroughly and clearly. Your brand should make your clients feel like they know you, they trust you, and they value your opinion and time. Build credibility. This can be done through expert features on related blogs, being published in print, sharing reviews from past clients, being referred by trusted people in your industry, and having a social media presence that shares your knowledge and inspires. Get personal and really get to know your client and their goals. This works in any creative industry because it helps show your clients that you genuinely care. Maya Angelou once said “I’ve learned that people will forget what you said, people will forget what you did, but people will never forget how you made them feel.” A perfect little lesson for business and for life. Thank you to Stephanie, for offering me this opportunity to chat value pricing with you! When you start to charge what you’re worth, your bottom line will increase, and balancing those books will be just a bit more fun. As a business owner, what’s one thing you can do to communicate your value?